The earliest birds arrive while winter reigns along the Platte River in central Nebraska. 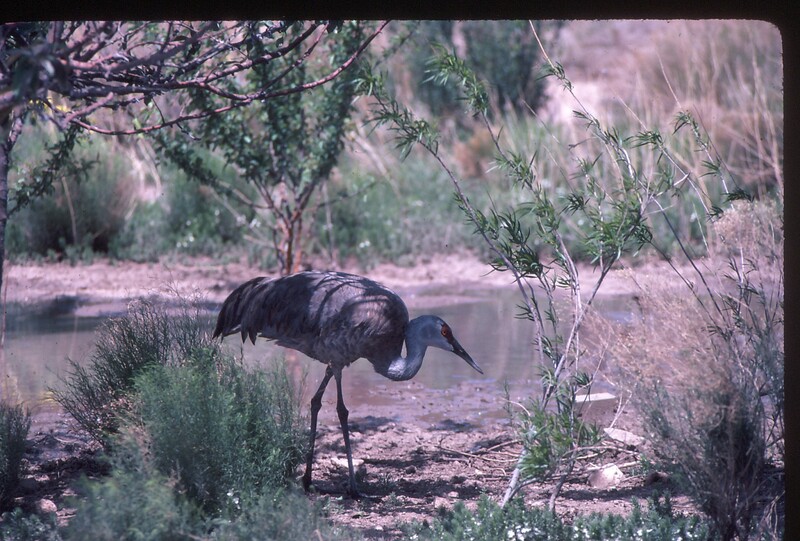 Leaving their wintering grounds in Arizona, New Mexico, Texas, and Mexico, most of the world’s population of lesser sandhill cranes follow an hourglass-shaped migration route that reaches its narrowest point where it crosses the Platte. Here the birds pause for almost a month to build up their fat reserves before dispersing widely over their breeding grounds in northern Canada, Alaska, and Siberia. You may see sandhill cranes in many states, but only in Nebraska and only in March will you find such a massive congregation of these birds. Sandhills don’t sojourn here alone; they share quarters with more than a quarter-million white-fronted geese and equally impressive numbers of mallards, pintails, and common mergansers. Then, in early April, the whooping cranes of Texas’ Aransas National Wildlife Refuge briefly lend their royal presence. What more could a naturalist ask for? Compared to the sandhills, human pioneers traveling along the Platte River in their Conestoga wagons were relative newcomers on the migrant trail. Sandhill cranes have been coursing across this river since before the last ice age, already browsing along the riverbanks when shaggy mammoths first came to drink. The sandhills date back even further in the northwest corner of the state, where fossilized sandhill bones that date back nine million years have been discovered. And now, after a many-millennia success story, man holds the fate of the Nebraska sandhills in his hands. Before the arrival of settlers, the Platte River meandered across a mostly flat Nebraska plain, choosing one course this year and another the next. “A mile wide and an inch deep” and “Too thick to drink but too thin to plow” are a couple of the descriptive phrases that have stuck to the Platte. When farmers recognized the potential of this fertile valley, they set out to tame the river by damming up its spring-thaw surges and storing them for irrigation. We reaped the benefits in abundant grains and tender cuts of meat. The sandhills suffered. A century ago, Francis Parkman described the Platte River Valley as being almost barren of trees. 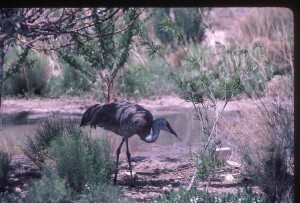 Conservationists may debate about how cottonwoods and willows managed to pioneer the riverbanks – because of man’s efforts in stopping the annual spring flooding or in controlling the wildfires that once burned tree seedlings – either way, trees have now replaced much of the open feeding and roosting grounds needed by both sandhills and geese. Farmers are now planting grain in the once boggy meadows along the river, and while waterfowl enjoy the grain leavings, they need the minerals and calcium that they once consumed while feasting on the invertebrates that resided among the native grasses. Finally, the much narrower river provides less security for the sandhill cranes. When the birds roosted on isolated sandbars, coyotes and dogs couldn’t prey so easily upon the weary travelers. The news, however, isn’t all bad – enough Nebraskans cared about the birds that rely on this stretch of the Platte to work out a compromise between the needs of the birds and those of man. They figured that if three-quarters of the native grassland in the Platte’s Big Bend region had been destroyed, one-quarter still could be saved. Focusing their attention on the 50-mile stretch of river between the cities of Kearney and Grand Island, conservationists inside and outside of government, farmers, and townspeople worked out an agreement that resulted in the establishment of the Platte River Whooping Crane Critical Habitat Maintenance Trust (Platte River Trust). This organization was formed to “protect and maintain migratory bird habitat” in the Big Bend of the Platte River. Within a decade, several thousands of acres of sandbars and riverside meadows had been purchased from landowners and set aside for the birds and other critters. Next, the new caretakers developed a plan for clearing encroaching trees and for encouraging the growth of native grasses by controlled burning and selective grazing. Because the number of acres is small, the land must be returned to optimum condition for the birds. And because public support is essential, adequate provisions must be made for visitors to the area. Even though the present wildlife reserve contains but a tiny percentage of the land that the birds once had at their disposal, it is a beginning, a recognition that man can fill his own needs without destroying the lives of his feathered and furred neighbors. Those who can remember the stentorian trumpeting of a sky filled with sandhill cranes know, sadly, that those days will never return, no more than the Platte River will regain its mile-wide status. The present number of sandhills, geese, and ducks that sojourn along the Platte River in March may be much smaller than in former years, but thanks to the work of the dedicated, those that do arrive will have a place to loaf and fatten up for years to come.